Originally appeared in the April 26, 2012 edition of the Southside Times. There are a few culinary tricks that can transform a familiarly fattening salad dressing into a lowfat imposter. The back of the classic Caesar dressing is anchovy, parmesan, and mayonnaise; but basic mayo (or aioli) is simply an emulsification of oil and egg yolks. Ay, there’s the rub, because there’s the fat, and fat has texture and flavor and all the things we love in a rich, creamy dip or dressing. So what good is creating a lookalike if it doesn’t taste alike? Well, for one thing, there’s not a whole lot of sacrificing happening here. Because of the anchovies and parmesan, Caesar has such a distinct flavor that your palate will be inclined to suspend our disbelief. Another classic component in a Caesar is Romaine. Yet lettuce, no matter how green it is, carries virtually zero punch when it comes to contributing any vitamins and minerals. Spinach, on the other hand, contains a fistful of nutrients. I like to pan-sear my tuna steaks, allow them to cook through, cool, and them crumble them on top of the bed of baby spinach. Let me know how it goes. With a few healthful altercations, I’m certain you’ll find this to be a more redeeming Caesar. 1. Season both sides of tuna steak with kosher salt and cracked black pepper. In a medium-sized sauté pan over medium-high heat, add a small amount of olive oil, allow to heat, and sear one side of each tuna steak. When color is golden, repeat the process on opposite sides. After a second sear is complete, place entire sauté pan in a 375 degree oven and allow tuna to cook until desired doneness (if you like it rare, skip the oven and evaluate doneness from the way the color creeps up sides of the tuna steak). After tuna is cooked to desired doneness, set aside and allow to rest for 10 minutes. 2. Meanwhile, in a medium-sized bowl, combine yogurt, garlic, anchovy, paprika, parmesan, and Worcestershire; whisk together and adjust seasoning with kosher salt and cracked black pepper. 3. Place two handfuls of fresh spinach in two serving bowls, and drizzle greens with dressing. 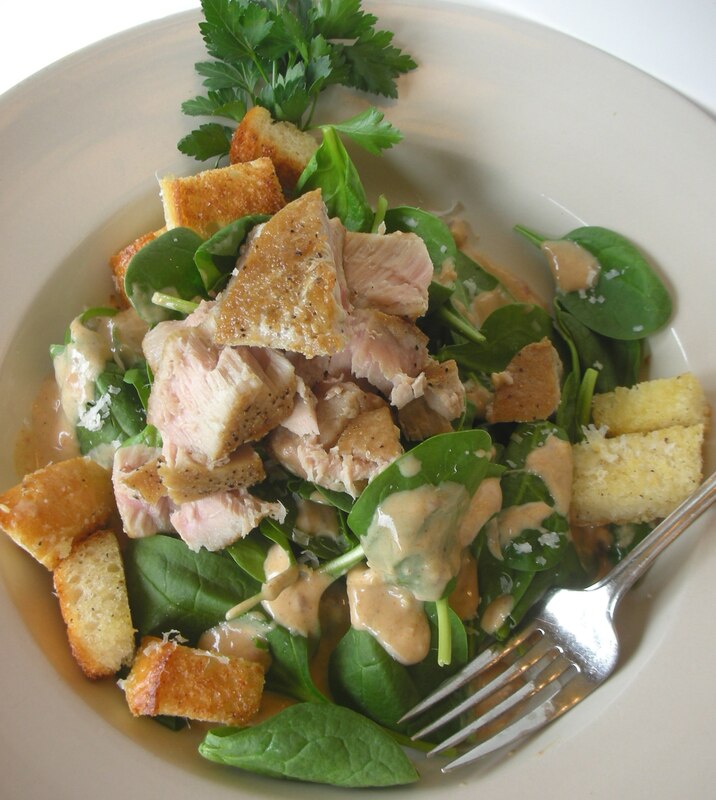 Place tuna on each salad, and garnish with extra parmesan and (optional) ciabatta croutons. Originally appeared in the April 19, 2012 edition of the Southside Times. Okay—so I slightly missed the window for in-season clams. 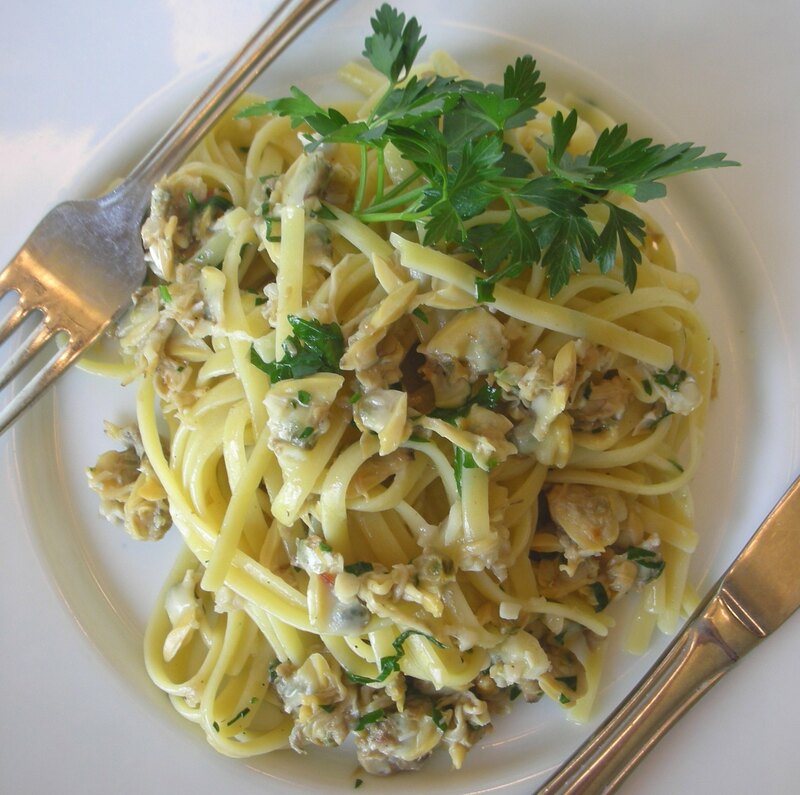 I had been so looking forward to sharing the recipe linguine alle vongole. What can I say? I got busy. And the notion of being busy (along with all its hectic trappings) makes a nice segue. Sometimes when you become overwhelmed by the lack of time in your day, you come understand that being spread so thin involves a certain amount of compromise. Whether it’s your career or your craft or both, culinary shortcuts are, from time to time, not only a reality but a way of survival. Substituting canned clams for the fresh, in-shell variety may not be a cardinal sin, but I like treating the classics like classics. So we’ll call this an ersatz vongole. This way, I can give an earnest nod toward the noble dish without feeling too awful deviant. The ingredients are pretty straightforward, and the dish itself is relatively easy to execute—something that, in a restaurant, could certainly be prepared a la minute, meaning all components (sauce, starch, protein) are cooked to order, and typically in the same pan. Maybe your conscience is clean. Maybe I just need to stop wringing my hands about this and start cooking my own batch of linguine and clams. 1. In a large pot of salted, boiling water, cooked linguine until al dente (or just cooked enough to have some bite). Meanwhile, in a sauté pan over medium heat, warm your olive oil. Add in clams and sauté briefly. Add garlic and stir, cooking until aromatic; add crushed red pepper. Pour in white wine and gently scrape bottom of pan with wooden spoon. Allow wine to reduce until the bottom of the pan is almost (that’s almost) dry. Add a small amount of reserved clam juice and bring to a simmer. 2. Briefly drain linguine and pour into clam sauce. Toss pasta and adjust seasonings. Lower heat and add butter, swirling into sauce until mixture thickens and butter melts. Adjust consistency with any remaining clam juice. Garnish plates with chopped Italian parsley. Originally appeared in the April 12, 2012 edition of the Southside Times. To be quite honest, I considered taking a shortcut here, with the pasta. In an effort to save you, dear reader, a step or two in this recipe’s execution, I tried tracking down fresh sheets of pasta that you could utilize for ravioli. But then I realized: the time it takes to get your hands on a package of fresh pasta sheets, is time better spent in the comfort of your kitchen, happily knocking out batch after batch of homemade ravioli. So, for the sake of time, let’s get to it, shall we? Homemade ravioli is, to employ an overused word, easy. All that’s required are four ingredients, a rolling pin (if you have a pasta machine, use that, but it’s not necessary), a clean counter, and some pastry cutters. The technique to use is the “well method,” in which a small indention is made in a mound of flour; the egg mixture then gradually incorporates the flour. Once you’ve accomplished a batch of this homemade pasta, you’ll be eager to experiment with your own fillings. The combination of corn and brie was something I’ve tinkering with, but don’t be afraid to simply substitute with your own amalgamation of ingredients. Just make it fun, filling, and fulfilling. 1. Using the “well method,” pour flour onto clean counter surface, and create a small indention; place eggs, oil, and salt in this indention. Using a fork, swirl the liquid against the flour, slowly incorporating the flour to create a soft dough. When it’s dry enough to be workable, knead the pasta dough for about five minutes until the texture is smooth. Form dough into a rectangular shape, wrap tightly in plastic, and place in refrigerator to rest. 2. Preheat oven to 400 degrees. In a bowl, toss corn kernels with a bit of olive oil (just enough to coat) and a pinch of kosher salt. Place aluminum foil on a sheetpan, spray with nonstick cooking spray, and pour kernels out evenly. Place in oven and roast until kernels have gained golden color (about 15 minutes). Remove corn from oven and place in bowl to cool; when cooled completely, add in cubed brie and basil. Set aside. 3. Remove pasta from plastic and cut in half, rewrapping the other half and setting aside. Dust clean work surface with a small amount of flour, and lightly dust a rolling pin. Maintaining the rectangular shape of the pasta, roll dough out into a long, thin sheet, rotating and flipping sides as you go. Once the pasta is very thin, add a small spoonful of filling to bottom half of the dough, allowing enough room at the top to fold the pasta over the filling (sort of like a pasta sleeping bag). Use a bit of eggwash (just a broken egg) to trace around the filling (this will act like glue). Fold top portion of dough down over the bottom, allowing for a small amount of space around the circumference of the filling. 4. Use your fingers to squeeze out any excess air, and use round pastry cutters to cut out the ravioli. Set completed ravioli aside. Once one batch is ready (about 6 at a time), gently drop into salted boiling water and cook for about 3 – 4 minutes. Meanwhile, place 2 tablespoons of butter in a sauté pan over medium heat. Allow butter to gain some browned color. 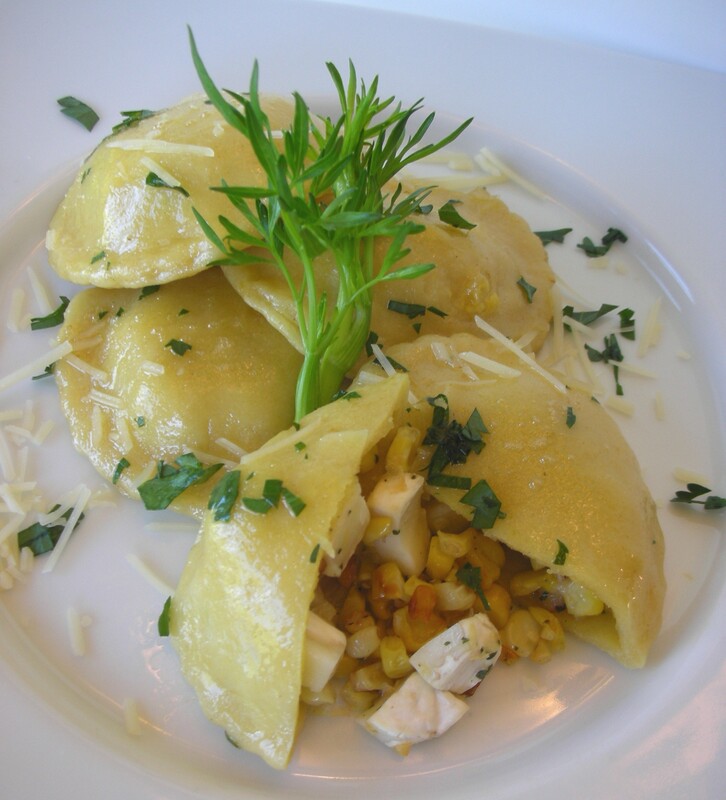 Use a slotted spoon to remove drained ravioli from water, and place pasta into sauté pan with browned butter. Add in sage and toss to coat ravioli. To garnish, sprinkle with toasted breadcrumbs and parmesan. Originally appeared in the April 5, 2012 edition if the Southside Times. With the temperate winter we experienced in Indiana, it feels like spring has been slowly sneaking in since January. But now that the mild season is officially here, it’s time to start turning our culinary attention to lighter, fresh fare. This week’s recipe contains a trio of individually constructed components, which unite to form an intricate dish. 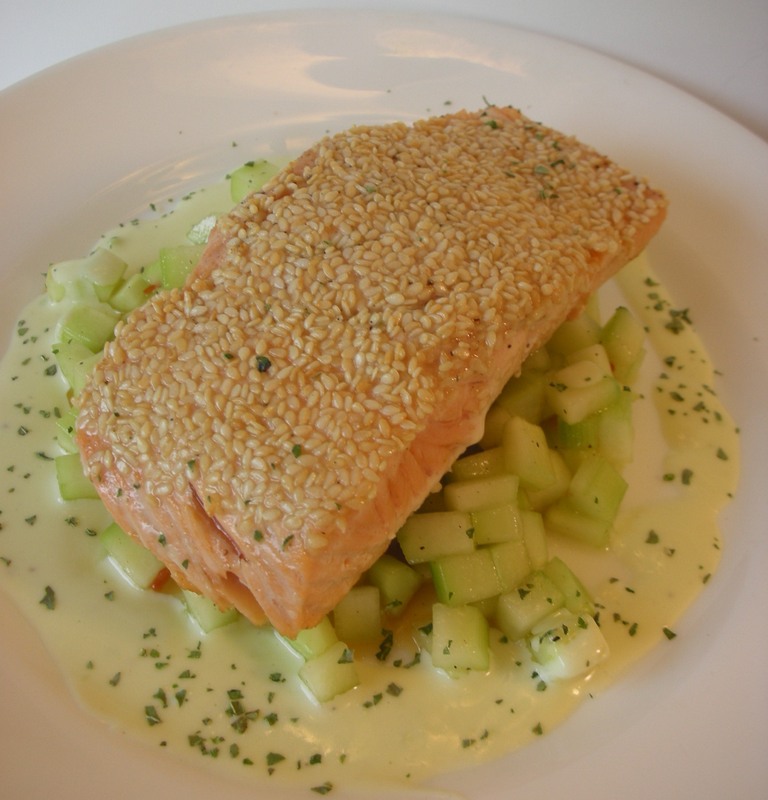 It might sound complicated, but don’t jump the gun—check it out: the technique for the salmon is a simple sear followed by a quick finish in the oven; the cucumber salad is composed of a painfully easy vinaigrette paired with the aforementioned veg; and the sauce is an adaptation of a stabilized lemon-butter sauce. The Asian influence shouldn’t be lost on you—both sesame seeds and sesame oil, rice wine vinegar, and wasabi powder should be dead giveaways. And while there’s a tricky flavor combination, there’s also contrasting elements of texture (crunch the seeds and a different crunch from the cucumber) and temperature (hot, warm, cold). Make sure your salmon is heated through and that your salad is cold, this makes the spicy sauce a delicious addition to an already busy plate. Give this one a shot—it’s an easy way to ease into spring. 1. In a medium-sized bowl, whisk together rice wine vinegar and sesame oil until an emulsion is formed. When vinaigrette is thick, add in seasonings and then cucumber. Coat cucumber with vinaigrette and refrigerate until service. 2. Place a large sauté over medium-high heat. Add sesame seeds to a wide bowl or pan. When sauté pan is hot, add a small amount of olive oil. Place each salmon steak (skin-side up) in sesame seeds, coating one side of the fish, and then gently place in the sauté pan. When sesame seeds begin to toast and become golden, carefully turn over to sear the opposite side of the fish. Remove from pan and repeat with second steak. Return both steaks to sauté pan, and place in 400 degree oven until salmon is cooked through (about 8 – 10 minutes). 3. While salmon cooks, prepare sauce: in a small saucepan over medium heat, add wine and reduce by half; slowly whisk in heavy cream and gently bring to a simmer. Whisk in wasabi powder and add in dissolved cornstarch mixture (called a slurry). When sauce is thickened, remove from heat and, in batches, whisk in butter. Adjust seasonings and set aside. 4. Remove salmon from oven. Add cucumber salad to each plate, and place salmon on top. Serve with warm wasabi sauce.